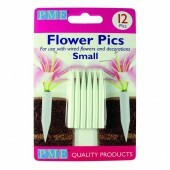 PME Small Flower Pics Food grade plastic pics for inserting florist wire into cakes! 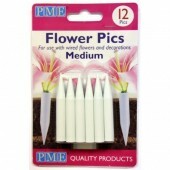 Pack ..
PME Medium Flower Pics Food grade plastic pics for inserting florist wire into cakes! 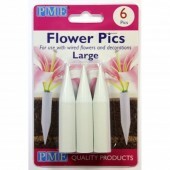 Pack..
PME Large Flower Pics Food grade plastic pics for inserting florist wire into cakes! Pack of 6.. Polystyrene Bud Cones are ideal for adding a light but bulky centre to your flowers. No need to .. Polystyrene Bud Cones are ideal for adding a light but bulky centre to your flowers. 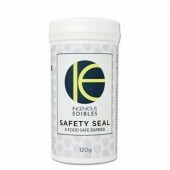 No need..
Safety Seal by Ingenious Edibles Make everything that touches your cake food-safe with Safety Sea..
CelBoards Grooved Veining Board Save hours with this Quality Non-stick sugarcraft rolling b..
PME Petal Shield Prevents flowers from drying out too soon. ..
Sugarcraft Wire Holder - Large 15"
Sturdy Plastic Sugarcraft Wire Holder - Large Such a handy product for storing all your flori..
Orchard Products 4.5" Mini Side Cutting Pliers Perfect for cutting and bending florists wire. ..
Orchard Products 5" Long Nose Pliers Perfect for cutting and bending florists wire. Wire..
Orchard Products 6" Japanese Diagonal Cutting Pliers Perfect for cutting and bending floris..
Jem Petal Former Great for dying petals and flowers 12 cavity 185mm x 140mm. Each cavity 33..
PME Flower Foam Pad The flower foam pad is ideal for use in making beautiful shaped petals and na..
PME Mexican Foam Pad These firm foam pads and specially designed to soften the edges of petals an..